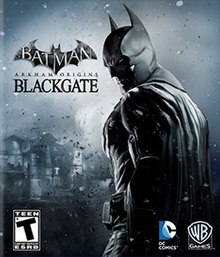 Batman: Arkham Origins Blackgate is a 2013 2.5D video game developed by Armature Studio and released by Warner Bros. Interactive Entertainment for the Nintendo 3DS and PlayStation Vita handheld game consoles. Based on the DC Comics superhero Batman, it is a companion to the 2013 video game Batman: Arkham Origins, and is a part of the Batman: Arkham series. It was released worldwide on October 25, 2013, with the Nintendo 3DS version releasing in Europe on November 8, 2013. The game was released in Japan on December 5, 2013, same date as Arkham Origins for home consoles, exclusively for the PlayStation Vita. A deluxe edition was announced and released for the Wii U eShop, PlayStation Network, Microsoft Windows and Xbox Live Arcade on April 1, 2014 in North America and April 2, 2014 in Europe. It features new maps, enemy encounters, difficulty levels, batsuits, and enhanced visuals from the original. Batman performing a glide kick on a group of enemies from a vantage point, one of the features incorporated from previous Batman: Arkham games. The free-flow combat system that is present in the other Arkham games has been built from the ground up. Batman still moves from left to right, but has the ability to be in the foreground or the background. Director Mark Pacini added that they've included a few more layers to the predator/detective mode. Players are able to see the sightlines of the enemies, which immediately allows to know whether Batman can be seen or not by enemies. When Batman is in detective mode, Batman changes color based on their proximity or based on how close he is to being seen. Vantage points, floor grates, silent takedowns, glide kicks, weapon use, and breakable walls return from the console games as well. Origins Blackgate offers side missions which help the player to piece together the events that lead to the explosion which caused the mass breakout. The level design allows the player to face the bosses of the game in any order, at any time. As such, the game features multiple endings, based on which boss the player faced last. The game also features different suits for Batman, each with their own attributes, that are made available based on the order the game is played. Origins Blackgate features a variety of characters from the history of Batman comics. The main character is Batman (Roger Craig Smith), a superhero trained to the peak of human physical perfection and an expert in martial arts. He is informed by G.C.P.D. Captain James Gordon (Michael Gough) on the events that have transpired at Blackgate Prison. Origins Blackgate brings Batman into conflict with the psychopathic Joker (Troy Baker), the Napoleonic weapons dealer Penguin (Nolan North), and the sadistic, brutal crime lord Black Mask (Brian Bloom). Batman also has altercations with the seductive Catwoman (Grey DeLisle), the expert-marksman Deadshot, prison fights champion Bronze Tiger, and the monstrous zombie Solomon Grundy. Warden Martin Joseph (Khary Payton), Bane, Amanda Waller (C. C. H. Pounder) and Captain Rick Flag also make appearances in the game. Set three months after the events of Arkham Origins, a mysterious explosion at Blackgate Prison allows Joker, Penguin and Black Mask to each gather enough henchmen in order to take over their own section of the prison. After being informed that Blackgate has been separated into three sections: the Cell Block, the Industrial Area, and the Administration Offices, Batman goes to investigate and he quickly learns that there is more to this than your average uprising. Batman also meets Catwoman and others for the first time, and begins to forge a relationship with a young Captain Gordon. While patrolling Gotham one night, Batman spots Catwoman stealing from a high-tech building, and chases her, eventually catching her and taking her to Blackgate, although not before having to deal with operatives belonging to the Department of Extranormal Operations due to their mistakenly assuming that he had been an accomplice in her theft. Two weeks later, Captain Gordon contacts Batman to inform him of an explosion at Blackgate, as well as multiple hostages held by the now free inmates. The prison has been divided into three main territories, each one held by the Joker, Penguin and Black Mask. Upon entering the prison, Batman encounters Catwoman, who informs him of hostages held inside the maximum security area of the prison, known as the Arkham Wing. As Batman, the player can choose to pursue the three bosses in any particular order. Before leaving, Catwoman also informs Batman that Joker has cut the air supply to the wing, leaving the hostages with minimal air. On his way to finding Joker, Batman encounters Warden Joseph rigged to bombs in his office. In an attempt to free him, he is attacked by Deadshot, who plans to kill Batman, after agreeing to do so for Joker, Penguin and Black Mask. Batman is able to defeat him and rescue Warden Joseph, who tells Batman that Joker is located in his office. Making his way to the office, Batman confronts the Joker and is able to defeat him, acquiring codes needed to shut down the gas set to release on the hostages. He notices, however, that the air supply was not cut as Catwoman had stated. On his way to stop Penguin, Catwoman again meets up with Batman, and informs him of a fighting contest Penguin is hosting. Going to the contest, Penguin states that Batman must fight Bronze Tiger to the death. Bronze Tiger, who is reluctant to fight Batman, does so but Batman is able to knock him unconscious. As Penguin's men begin to attack, Bronze Tiger regains consciousness, and is able to injure Penguin and hold off his men long enough for Batman to pursue Penguin. Batman is able to catch up to him and then defeat him. Batman learns Black Mask is attempting to overload Blackgate's power generators, causing a chain reaction which shall destroy his rivals. As he makes his way through the sewers, Batman encounters and defeats Solomon Grundy. Later, he encounters Black Mask and his men, and fights them. He finally knocks Black Mask unconscious, stopping his attempts. After defeating Joker, Penguin and Black Mask, Batman is able to enter the Arkham Wing where the hostages are being held. When he gets there, he does not find any hostages, only a weakened Bane. Catwoman reveals that there were never any hostages, and that Bane was the target she was hired to recover. Batman pursues Catwoman to the docks and confronts her. Despite Catwoman's efforts, Batman defeats her. Before he can learn her employer's identity, a SWAT team led by Captain Rick Flag arrives to arrest her. However, Batman questions the actions of the team and flies off into the night. The ending of the game changes, depending on whichever boss is saved for last: Joker is found by several Blackgate guards, who are presumably killed. He then takes the uniform of one of them and flees the scene; Penguin is freed by a corrupt prison guard after bribing him, and is revealed to be running his illegal operations from inside the prison. He then uses his umbrella to kill the corrupt prison guard who freed him because of his rudeness toward him, and leaves; Black Mask is also found by a few Blackgate guards, but then awakens from his earlier battle and takes one of them hostage, while demanding the Joker handed over to him. One of the guards shoots at him, but misses and hits a pipeline, which explodes. Black Mask is heard screaming, and disappears from the scene. Throughout the game, Amanda Waller is seen monitoring the events of the breakout along with Rick Flag. In a post-credits scene, it is revealed that Waller was the one who hired Catwoman to break Bane out of Blackgate. Per Waller's orders, Catwoman was released, but she did not complete her main mission, and Flag's team had to return Bane to custody. It is seen that Waller has Deadshot and Bronze Tiger in her helicopter, remarking she sees them as soldiers, as opposed to degenerates. As her helicopter flies away from Blackgate, one of Batman's trackers is seen on its underbelly. The game was first revealed on the cover of the May 2013 issue of Game Informer magazine, revealed on April 9, 2013. Director Mark Pacini revealed that the game has been in development since early 2012. Many of the production team came over from Retro Studios, which developed the Metroid Prime series. Origins Blackgate has a similar feel and construction to those games. None of the console-game technology is being used for the game, with everything being done by Armature from scratch. The game uses a checkpoint system to save, as well as have the ability to save anywhere at any time. All of the 2D animations were done in house at Armature and are fully voiced. While set after the events of Arkham Origins, Armature Studio worked closely with WB Games Montréal to allow the games to be played in any order and not spoil any of the material from either game. The story of Origins Blackgate is written by Adam Beechen. Armature's technical director, Jack Mathews, has stated that neither of the two versions is a port of the other, with the graphics as the only difference between the two platforms. Matthews further stated that Armature has custom tools to help generate ideally sized models and textures for each platform from a common source, and that the 3DS version would run at 30fps in 3D. Cutscenes look like hand-drawn comics, while voice acting is included. The game adds dynamic camera angles to help give a better sense of scope in the 2D plane. For example, the camera can zoom in over Batman's shoulder as he is on a zipline or swoop up to a top-down vantage point when on a gargoyle for an inverted takedown. By linking the game to Arkham Origins on the PlayStation 3, a skin based on Beware the Batman becomes available. Following its release, Batman: Arkham Origins Blackgate received generally mixed reviews. Aggregating review website GameRankings gave the Nintendo 3DS version 69.62% and the PlayStation Vita version 60.53%, while Metacritic gave the 3DS version a 68/100 and the Vita a 61/100. Reviewers were polarized over the transition of the home console game to portable devices. Polygon and IGN said that Arkham Origins Blackgate successfully distilled the gameplay mechanics of Arkham Origins. However, others said that the game came across as sloppy and unfinished while doing nothing to advance the series or its characters. Reception of the game's prison setting was generally negative. Reviewers criticized the level designs as repetitive, dark, and sparse outside of areas decorated by the Joker, and several critics noted a difficulty in navigating the facility due to poorly highlighted avenues of travel such as destructible walls that can not be viewed at all outside of the game's scanning mode. Game Informer noted that even when an interactive element is obvious, it cannot be used until the player spends several seconds highlighting and scanning it, a process they found inconvenient. Conversely, Polygon said the game world featured impressive and expansive levels, and appreciated the various unlockable avenues of exploration hiding secret items. Several reviewers were critical of necessary backtracking through previously explored areas, calling them boring and citing a lack of regenerating enemies as a problem, leaving cleared areas permanently empty. GameSpot took issue with the difficulty of navigating some areas due to the game's 2.5D viewpoint that involves the player normally moving left or right, but periodically entering vents or doors in the background of levels, creating constantly shifting perspectives. Navigating the levels was noted as a point of difficulty, with the in-game map failing to clearly define the player's location, sometimes making it appear that Batman is in a room he needs to be, when he is in fact multiple levels above or below it. The series' familiar combat was considered to have been effectively streamlined while retaining the console versions fluid, simple and satisfying movement with effective striking and countering. Some reviewers considered the transition to be less successful, lacking the same intensity and making enemies easier to defeat, preventing the same kinetic bouncing between enemies of the console games. Controlling Batman during combat was noted to be less precise and responsive, and the 2.5D perspective would see Batman often target the closest, rather than intended, enemy across multiple planes, preventing effective combat strategies as more varied enemies begin to appear. Polygon said that the boss fights were imaginative, while Game Informer said they were the best part of Arkham Origins Blackgate, utilizing specific traits of each villain in their attacks, and strategies for defeating them. IGN noted the novelty of the game featuring bosses that had not appeared in the other Arkham games, but considered the fights to be simplified and heavily reliant on button prompts. However, reviewers also found the fights frustrating, poorly explained, and punitive, featuring attacks that can instantly kill Batman, requiring lengthy loading times to place the player at an earlier point in the game, then requiring some backtracking before the fight can again be attempted. ^ Mathews, Jack (August 9, 2013). "Awesome Blackgate wallpaper courtesy of our Art Director, Todd Keller". Twitter. Retrieved September 14, 2013. ^ a b Armature Studio (September 30, 2013). "Adam Beechen. Don't think he did Arkham Origins". Twitter. Retrieved September 30, 2013. ^ a b c d e Miller, Matt (April 19, 2013). "Batman Meets Metroid In Arkham Origins Blackgate (Page 1)". Game Informer. GameStop. Archived from the original on August 30, 2013. Retrieved April 20, 2013. ^ a b Vore, Brian (April 9, 2013). "May Cover Revealed: Batman: Arkham Origins". Game Informer. GameStop. Archived from the original on August 30, 2013. Retrieved April 9, 2013. ^ Phillips, Tom (October 18, 2013). "Batman: Arkham Origins' Wii U and physical PC versions will launch later in Europe". Eurogamer. Retrieved October 18, 2013. ^ "Brian" (September 2013). "Batman: Arkham Origins dated for Japan, Blackgate 3DS not coming over". Nintendo Everything. Retrieved February 21, 2014. ^ Williams, Katie (February 10, 2014). "Batman: Arkham Origins Blackgate Coming to XBLA". IGN. Retrieved February 11, 2014. ^ Griffiths, Brendan (October 1, 2013). "Batman: Arkham Origins Blackgate Hands-On Preview - The Vita's Knight Rises". Dealspwn. Archived from the original on 1 November 2013. Retrieved October 1, 2013. ^ a b c Robinson, Seth (September 10, 2013). "Batman: Arkham Origins Blackgate - An Intriguing Mixture of Game Genres". Newsarama. Retrieved September 11, 2013. ^ a b c d Miller, Matt (April 19, 2013). "Batman Meets Metroid In Arkham Origins Blackgate (Page 2)". Game Informer. GameStop. Archived from the original on August 30, 2013. Retrieved April 20, 2013. ^ a b c Narcisse, Evan (August 31, 2013). "Batman's Next Portable Game Has Some Castlevania, Metroid and Mega Man". Kotaku. Archived from the original on September 1, 2013. Retrieved September 1, 2013. ^ a b c d e f Hussain, Tamoor (September 12, 2013). "Voice Cast from Arkham Origins Confirmed for Origins Blackgate". CVG. Archived from the original on 16 September 2013. Retrieved September 12, 2013. ^ a b c Lien, Tracey (June 11, 2013). "Batman: Arkham Origins Blackgate to Feature Batman's First Encounter with Catwoman". Polygon. Archived from the original on August 30, 2013. Retrieved June 12, 2013. ^ a b Funk, John (August 30, 2013). "The Inmates Take Over in Batman: Arkham Origins Blackgate Trailer". Polygon. Archived from the original on August 30, 2013. Retrieved August 30, 2013. ^ a b Hilliard, Kyle (August 30, 2013). "Batman: Arkham Origins Blackgate Trailer Sets Up The Story". Game Informer. GameStop. Archived from the original on August 30, 2013. Retrieved August 30, 2013. ^ a b Stamback, Brigador (August 30, 2013). "Blackgate is Under New Management". Moresay. Archived from the original on 24 June 2014. Retrieved September 14, 2013. ^ Payton, Khary (October 26, 2013). "Yep. Warden Joseph. But u missed my other guy!". Twitter. Retrieved October 27, 2013. ^ Clow, Chris (October 31, 2013). "Game Review - Batman: Arkham Origins, Plus Collector's Edition Extras". GeekNation. Archived from the original on 2013-11-04. Retrieved November 3, 2013. ^ Batman Arkham (September 1, 2013). "Batman: Arkham Origins Blackgate is Set Three Months After The Events of Arkham Origins". Facebook. Retrieved September 1, 2013. ^ Ishaan (May 20, 2013). "Batman: Arkham Origins Blackgate Developed in Parallel On Vita And 3DS". Siliconera. Archived from the original on August 30, 2013. Retrieved June 2, 2013. ^ Turi, Tim (June 12, 2013). "Hands-on With Batman: Arkham Origins Blackgate". Game Informer. GameStop. Archived from the original on August 30, 2013. Retrieved June 12, 2013. ^ Kollar, Phillip (June 12, 2013). "A Tale of Two Batmen: The Dueling Philosophies of WB Montreal and Armature Studio". Polygon. Archived from the original on August 30, 2013. Retrieved August 30, 2013. ^ Galletta, Ryan (October 24, 2013). "Batman: Arkham Origins Out Tomorrow on PS3". PlayStation Blog. Retrieved November 20, 2013. ^ a b "Batman: Arkham Origins Blackgate". GameRankings. Retrieved January 24, 2014. ^ a b "Batman: Arkham Origins Blackgate Nintendo 3DS". Metacritic. CBS Interactive. Retrieved January 24, 2014. ^ a b "Batman: Arkham Origins Blackgate PlayStation Vita". Metacritic. CBS Interactive. Retrieved January 24, 2014. ^ "Batman: Arkham Origins Blackgate - Deluxe Edition for PC Reviews". Metacritic. Retrieved 2016-09-20. ^ "Batman: Arkham Origins Blackgate - Deluxe Edition for Xbox 360 Reviews". Metacritic. Retrieved 2016-09-20. ^ "Batman: Arkham Origins Blackgate - Deluxe Edition for PlayStation 3 Reviews". Metacritic. Retrieved 2016-09-20. ^ a b c d Bonds, Ian (October 31, 2013). "Review: Batman: Arkham Origins Blackgate". Destructoid. Retrieved November 7, 2013. ^ a b c d e f g Reiner, Andrew (October 25, 2013). "Batman: Arkham Origins Blackgate Prison Is Hell". Game Informer. GameStop. Archived from the original on 2013-11-29. Retrieved November 7, 2013. ^ a b c d Bischoff, Daniel R. (November 5, 2013). "Batman: Arkham Origins Blackgate (Vita) Review". Game Revolution. Net Revolution Inc. Retrieved November 7, 2013. ^ a b c d e Brown, Peter (October 25, 2013). "Batman: Arkham Origins Blackgate Review". GameSpot. CBS Interactive. Archived from the original on 12 November 2013. Retrieved November 7, 2013. ^ a b c d e Osborn, Chuck (October 25, 2013). "BATMAN: ARKHAM ORIGINS PRISON CAPERS". IGN. J2 Global. Archived from the original on 28 October 2013. Retrieved November 7, 2013. ^ a b c d e Riendeau, Danielle (October 25, 2013). "BATMAN: ARKHAM ORIGINS BLACKGATE REVIEW: TRUST". Polygon. Vox Media. Retrieved November 7, 2013.